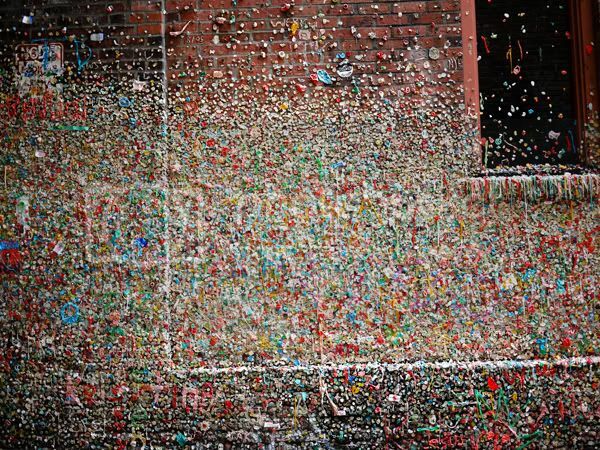 Ever heard of something as incredible as a Gum Wall? :) I'm quite the germ-o-phobe but when I heard about this place in Seattle's Pike Place Market, I couldn't wait to check it out. Isn't it a sight to behold?? 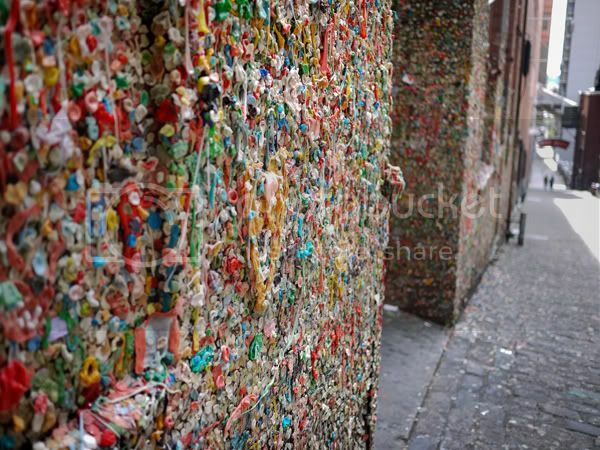 :D All the infinite rows of GUM. I just loved it. THE COLOURS! Apparently it was named one of the Top 5 GERMIEST Attractions in the world but when I laid my eyes on it, I just saw a place borne out of fun. 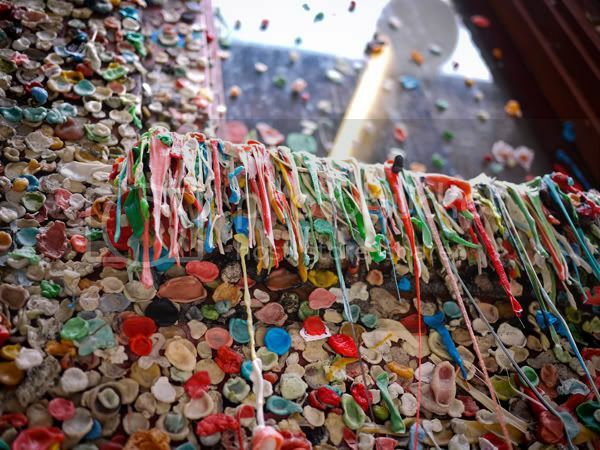 So just a little about its history, as it's right by the box office of a theater (that I don't think exists anymore), in the early 1990s, customers who were impatient about having to wait in line to get their tickets starting sticking the chewing gum onto the wall. 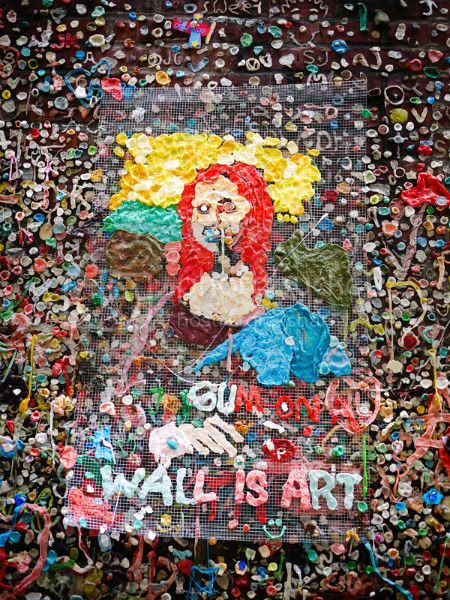 The theater attendants tried scraping the Gum Wall twice (I pity anyone who was tasked with that job) but in 1999 it became a certified tourist attraction so they wisely gave up. Can you identify the painting it's supposed to resemble? :) I can't say I disagree with that statement! 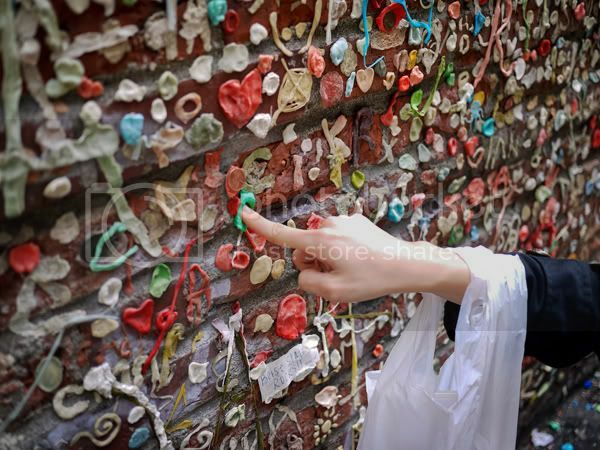 Of course, I had to leave my mark on the Gum Wall for posterity to appreciate. Oh Green Apple flavored gum, may you remain among the millions of other pieces of gum, an everlasting testimony to the wacky creativity that flourishes in a society where gum is not on the list of banned items.